I love this series, it's super great. And I am SO excited for book number THREE to be released! I can't wait to get back in to Chase and Ember's story. If you haven't read this series yet, I definitely recommend that you do so! And then come back and chat with me about it. I can't believe I haven't started this series yet. I've heard so many good things. Fantastic pick! I shall start this soon. OOh nice! Been seeing lots of this series lately! Hope you enjoy this one! I still haven't read Article 5 yet. I can't believe book three is already being released! Looks like I'll have to move this series up on my TBR list. I still need to read the second book and hope to very soon. I enjoyed the first one but haven't yet read the second...and now the third one's coming out?!? I'm so behind. 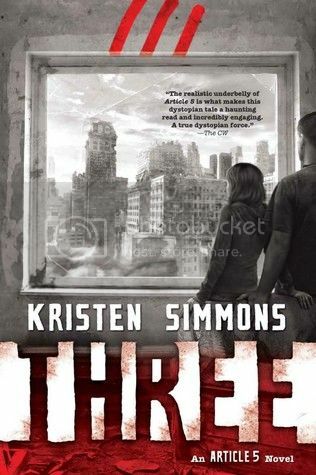 I love that this book is simply called Three-makes it very easy to figure out where it comes in the order of the series.